Farmtool will accept any number of farm, business or professional enterprises. When adding a new enterprise, a standard list of income and expense categories, along with a modified set of CRA account numbers may be entered as well. Clicking the “Income” tab on the “Enterprises” screen brings up the following screen. Income categories may be added, deleted or modified at any time. Category numbers may be changed as well. When a new income or expense category is added, the business-portion percentage may be set to the portion used for tax purposes. The category may be flagged as “Zero Rated” for GST purposes, or flagged as “Inventoried” for integration with Farmtool Companion. 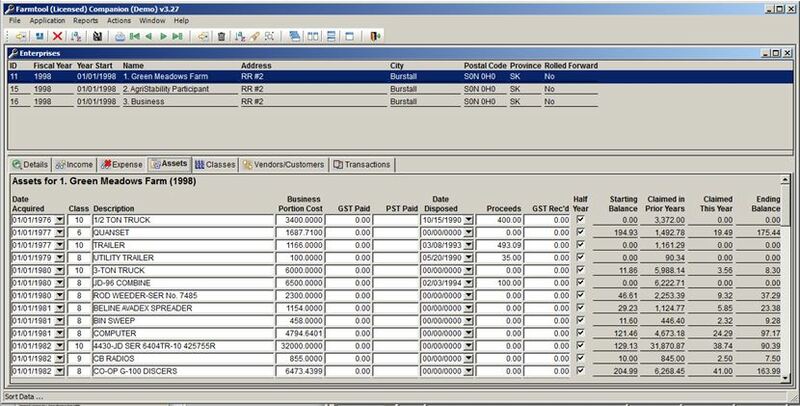 Clicking the Asset tab shows all assets for the selected enterprise as well as the class, date of purchase, business portion cost, GST & PST paid, disposal date if sold or traded, as well as the depreciation data shown below. 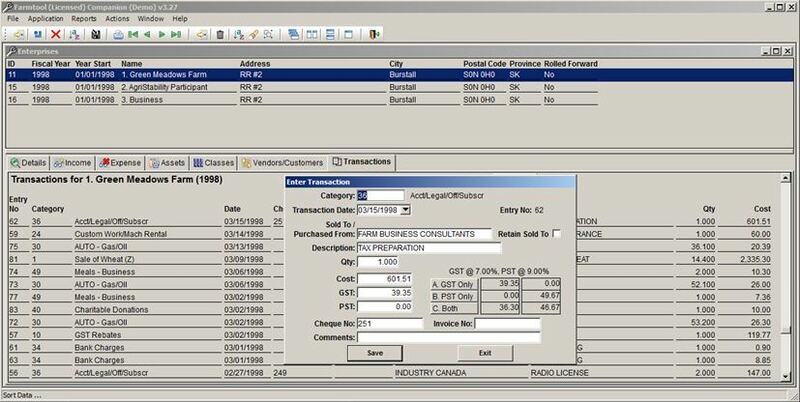 Farmtool calculates the depreciation to date, the current year CCA claim and the balance at the end of the current year. 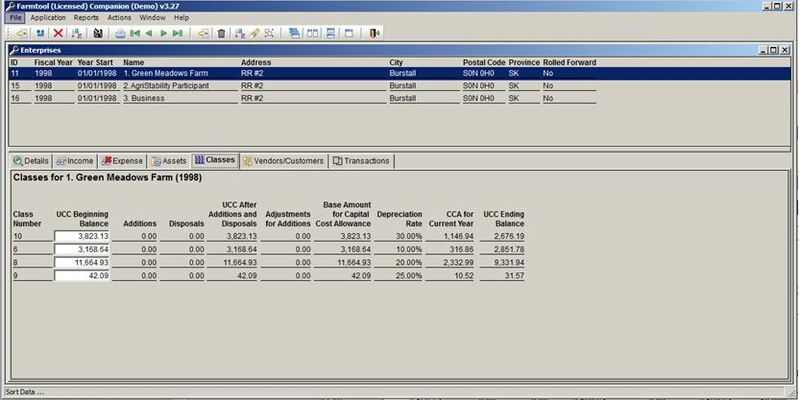 Farmtool keeps the starting UCC balance in each class, cost of additions and disposals, then calculates the current year claim, adjustments for half-year rule, and the closing UCC balance in each class. 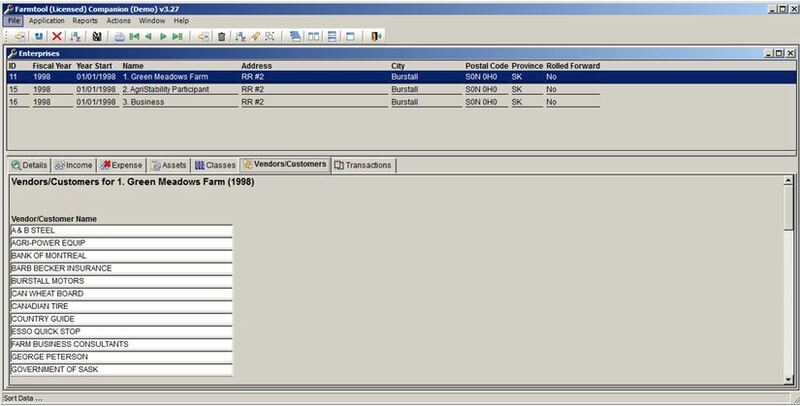 A list of vendors can be maintained for quick access. 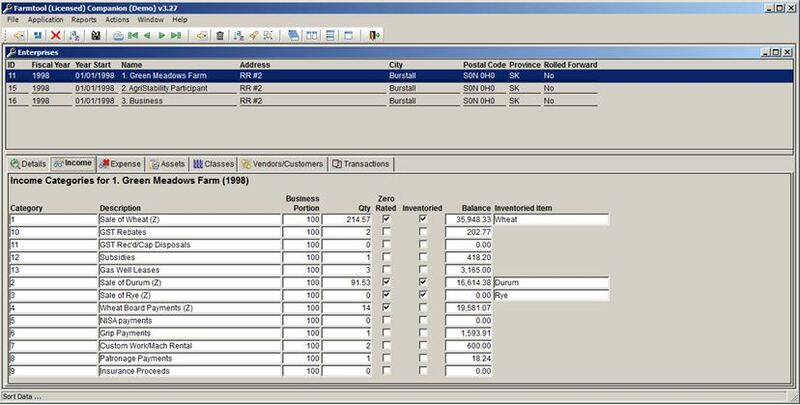 Invoices entered in the transactions screen are arranged in order by date, by entry number, by category, by Customer/Vendor, by description, quantity, or by cost or whatever order you choose. A sophisticated search procedure is available to find records belonging to any special group of your choice. 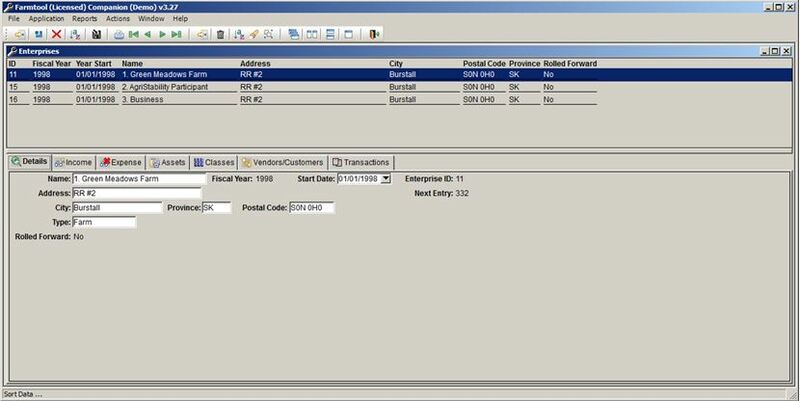 Invoices are entered into the Transaction Entry screen. The Category is chosen from a list by double clicking in the Category field. The customer/vendor may be chosen from a list by putting one or two letters in the name and taking the down arrow. 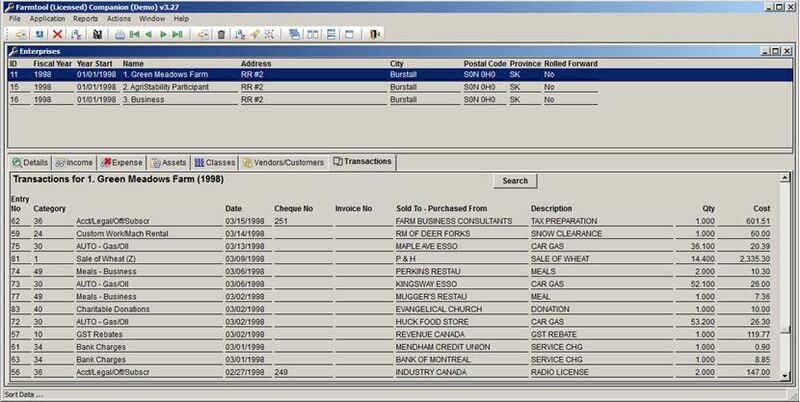 If a new customer/vendor, it may be added to the database. The GST & PST are calculated by the computer and may be entered with a single keystroke or click of a button.